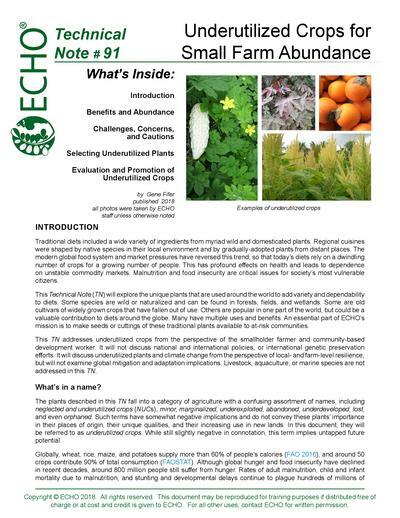 ECHO Tech Notes are subject-specific publications about topics important to those working in the tropics and subtropics. Our material is authored by ECHO staff and outside writers, all with experience and knowledge of their subject. 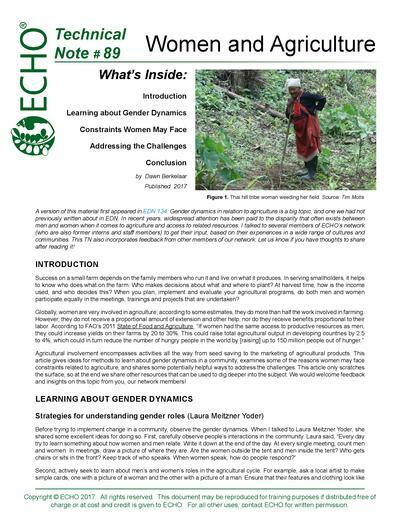 These documents are free for your use and will hopefully serve a valuable role in your working library of resources in agricultural development! 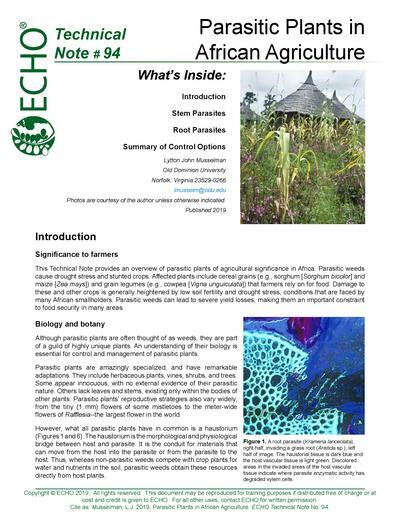 This Technical Note provides an overview of parasitic plants of agricultural significance in Africa. Parasitic weeds cause drought stress and stunted crops. Affected plants include cereal grains (e.g., sorghum [Sorghum bicolor] and maize [Zea mays]) and grain legumes (e.g., cowpea [Vigna unguiculata]) that farmers rely on for food. Damage to these and other crops is generally heightened by low soil fertility and drought stress, conditions that are faced by many African smallholders. Parasitic weeds can lead to severe yield losses, making them an important constraint to food security in many areas. Many plants deemed as invaluable for the smallholder farmer offer nutritious food for the family, fodder for animals, or timber for construction. Remarkably, bamboo offers all three of these assets from the same perennial plant! 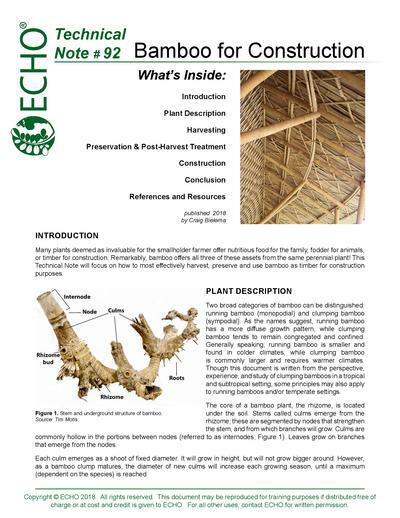 This Technical Note will focus on how to most effectively harvest, preserve and use bamboo as timber for construction purposes. 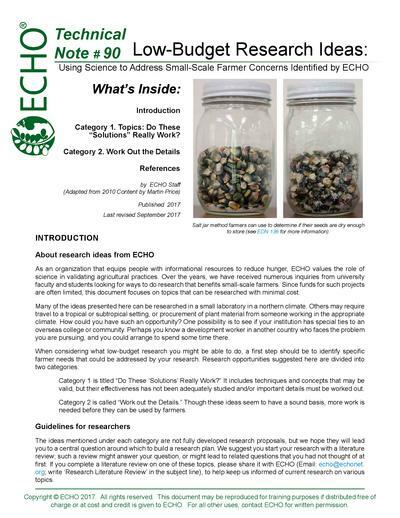 As an organization that equips people with informational resources to reduce hunger, ECHO values the role of science in validating agricultural practices. Over the years, we have received numerous inquiries from university faculty and students looking for ways to do research that benefits small-scale farmers. Since funds for such projects are often limited, this document focuses on topics that can be researched with minimal cost. Many of the ideas presented here can be researched in a small laboratory in a northern climate. Others may require travel to a tropical or subtropical setting, or procurement of plant material from someone working in the appropriate climate. How could you have such an opportunity? One possibility is to see if your institution has special ties to an overseas college or community. Perhaps you know a development worker in another country who faces the problem you are pursuing, and you could arrange to spend some time there. Category 1. Topics: Do These “Solutions” Really Work? 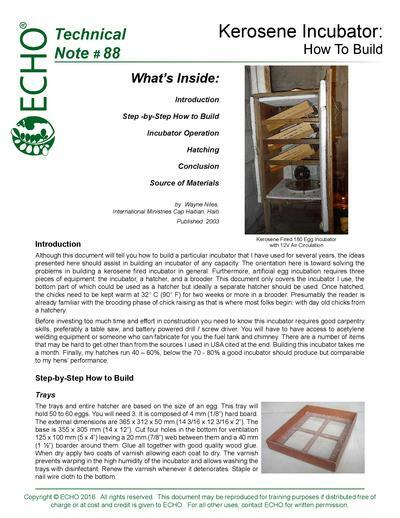 Although this document will tell you how to build a particular incubator that I have used for several years, the ideas presented here should assist in building an incubator of any capacity. The orientation here is toward solving the problems in building a kerosene fired incubator in general. Furthermore, artificial egg incubation requires three pieces of equipment: the incubator, a hatcher, and a brooder. 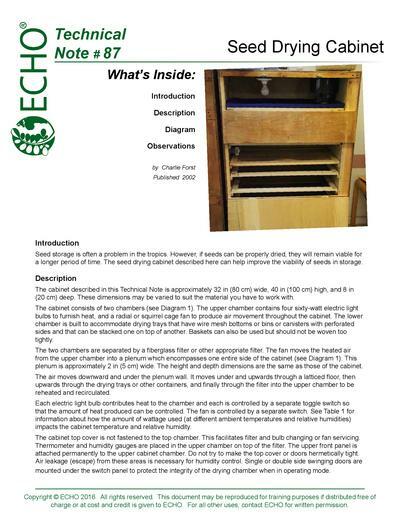 This document only covers the incubator I use, the bottom part of which could be used as a hatcher but ideally a separate hatcher should be used. Once hatched, the chicks need to be kept warm at 32° C (90° F) for two weeks or more in a brooder. Presumably the reader is already familiar with the brooding phase of chick raising as that is where most folks begin: with day old chicks from a hatchery. Before investing too much time and effort in construction you need to know this incubator requires good carpentry skills, preferably a table saw, and battery powered drill / screw driver. You will have to have access to acetylene welding equipment or someone who can fabricate for you the fuel tank and chimney. There are a number of items that may be hard to get other than from the sources I used in USA cited at the end. Building this incubator takes me a month. Finally, my hatches run 40 – 60%, below the 70 - 80% a good incubator should produce but comparable to my hens’ performance. Seed storage is often a problem in the tropics. However, if seeds can be properly dried, they will remain viable for a longer period of time. 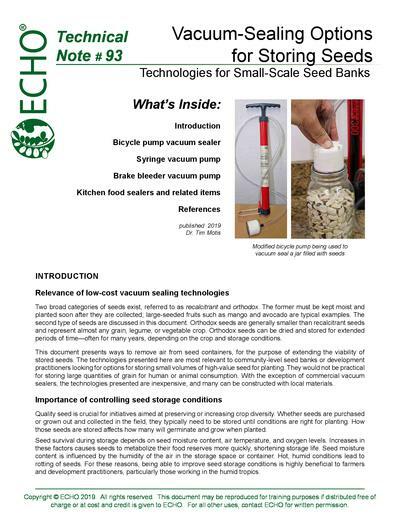 The seed drying cabinet described here can help improve the viability of seeds in storage. 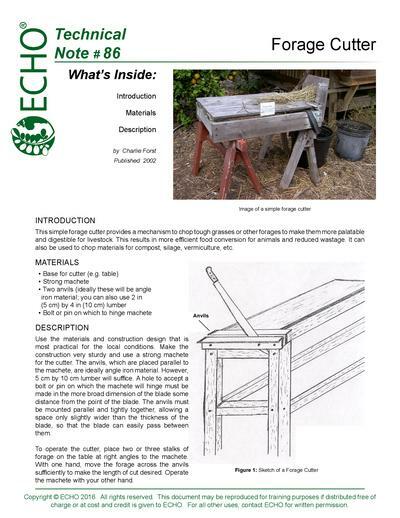 This simple forage cutter provides a mechanism to chop tough grasses or other forages to make them more palatable and digestible for livestock. This results in more efficient food conversion for animals and reduced wastage. It can also be used to chop materials for compost, silage, vermiculture, etc. Briquettes made from materials that cost little or no money to obtain, such as old newspaper or unutilized plant waste, can be a cost-effective alternate fuel to charcoal or firewood. This could alleviate the harsh pressures put on many forests for providing enough fuel energy to meet people’s needs. At the same time, it could prevent the wastage of materials that still have value, so they will not be ‘thrown away’, discarded as litter, or left to rot. Many different methods and technologies exist for pressing briquettes, each with its own unique advantages and disadvantages. 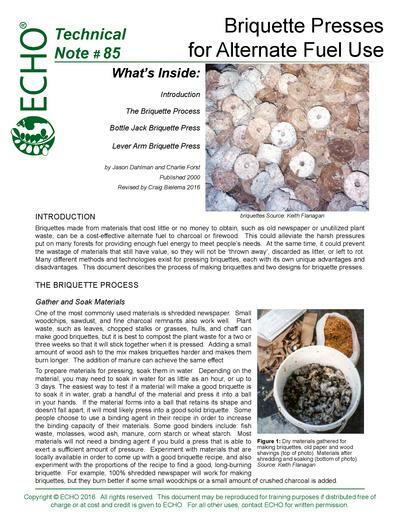 This document describes the process of making briquettes and two designs for briquette presses.